Horse's leg with standing wrap to protect bandage. Whether a horse is involved in competitive sports, trail riding, cattle work, or is simply a pleasure horse, keeping the horse's legs safe is an important priority since the legs are key to every movement. In proportion to the horse's body, the slender legs bear a tremendous amount of weight and also take on extreme amounts of stress when the horse must move quickly, make quick changes in direction, and stop suddenly. A standing wrap, also known as a stable bandage, usually has a padding base made of a quilted fabric to protect the horse's leg with the wrap bandage to hold it in place. The standing wrap is applied to the horse's lower leg and usually stretches from the bottom of the knee or hock to below the fetlock. A standing wrap helps protect the horse's legs, tendons, and ligaments, while the horse is in a stall or during transport. Standing wraps can be beneficial if a horse has a tendency to be restless in the stall, or if the horse's legs tends to stock up or swell after exercise. A standing wrap during transport is a must for some horses. The wrap protects the horse's legs entering the trainer, during transport, and again as the horse leaves the trailer. One little slip entering or departing a trailer can take the skin and hair coat off a leg and end up requiring both down time and veterinary care. Using a standing wrap is a cost-effective way to protect a horse's legs. If your horse decides that standing wraps are not his thing - then you have some training and desensitization to do. It's for his own good, your peace of mind, and your wallet. In addition, standing wraps can be used for injuries to the horse's legs, but this should be at the discretion of a veterinarian. Using a wrap can help keep cuts, wounds, and other injuries clean while they heal. In addition, standing wraps are beneficial when poultices or liniments need to be used, again at the discretion of a veterinarian. A veterinarian should advise on the use of standing wraps with any product, since some products can produce excessive heat, thus causing the horse discomfort or pain if used under a wrap. 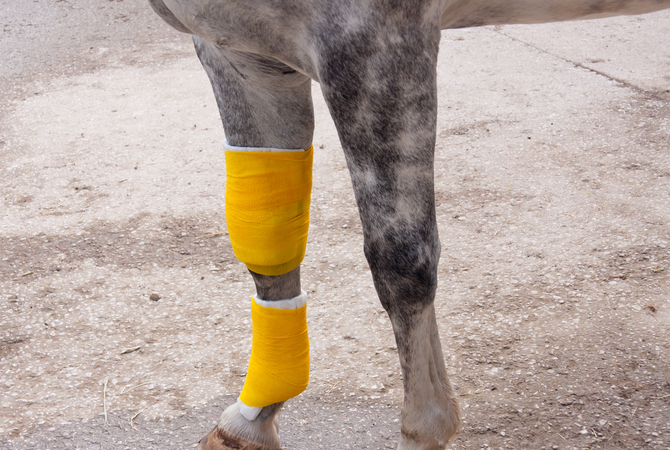 According to Lydia F. Gray, DVM, MA, SmartPak Staff Veterinarian, the standing wrap is the most basic bandage used on a horse, and one that every horseman should know how to do properly. It's also important to understand when and why to bandage a horse for his optimal health and well-being. A standing wrap on a dry leg is the basic level. It gives your horse's leg support, provides warmth and promotes circulation to prevent the leg from filling with fluid, commonly called stocking up. This type of application can be used if a horse tends to stock up while standing still, especially after working, or to prepare a conformation hunter who is showing the following day. After a dry standing wrap, the next level of support is to add a liniment directly to your horse's leg under the wrap to help stimulate blood flow. The third level of support is a poultice under a standing wrap to relieve inflammation or in situations where heat is desired, to apply heat pack of some kind to the horse's limb. Although it is not overly difficult to master the skill of applying a standing wrap, it is vital to pay close attention to what you're doing and to be particular about the end result. A loose standing wrap or one that is applied too tightly or not securely enough can injure your horse. Use a quilted fabric pad made out of cotton and available in several heights such as 12, 14, or 16 inches to match the height of front or hind legs in large or small horses. Over this base, you will apply a 5" to 6" wide by 12' standing wrap bandage. A standing wrap bandage is different from a polo wrap in that it is stiffer, less elastic, and provides more uniform support across the width of the bandage. Roll the wrap snugly and evenly to make unrolling against the leg easier and more uniform. Finally, make sure your horse's legs are clean and dry, that he's standing on a level location, and that he's either tied safely or someone is holding him. The first rule of thumb: If wrapping one front or hind leg is to wrap the other one also. Not only does wrapping both legs provide equal support, especially important in the case of an injury where circulation might be compromised, the horse may be less likely to chew or kick a bandage off if both legs feel the same. The next rule is to put the roll to the back. That is, place the end of the bandage in front of the leg and keep the rolled up portion in back of the leg about midway down the cannon on the outside of the limb, The inside of the roll should be facing you. Center the quilt between the knee and fetlock. When you have unrolled the quilt completely, wherever it stops just tuck the end of your standing bandage an inch or two inside the end of the quilt. Adjust the length if necessary. Now hold on to this end while smoothly unrolling the bandage that holds the quilt in place so that the first wrap covers the end. Once the end is secured you can let go of it and head down the leg with the wrap. Each turn should cover about 50% of the material from the last turn. Try to keep an even tension on the bandage as you wrap, neither tugging in places nor letting it go loose. Spiral down the leg, up the leg, and end in the middle. These are the basic instructions for applying a standing wrap. With practice you will soon learn just where to start, the correct tension and how much to overlap so that you end halfway down the outside of the leg every time. Keep in mind there are many variations depending on the horse and the need for the standing wrap. Whether the standing wrap is to prevent swelling while standing in a stall, to protect from injury while being transported, or to protect an injury, the standing wrap should be applied by a person who understands the anatomy of the horse's legs and how they function. Ask a knowledgeable trainer or a veterinarian to teach you and then practice before you attempt to apply a wrap to your horse's legs. Wrap from the front to the back of the horse's leg, and then through the legs as you return to the front. Any tension on the bandage should pull the tendons on the back of the horse's legs toward his midline. Start the bandage in the middle, wrap down first, and then back up and depending on the reason for the wrap finish at the top or wrap down to the middle to finish. Be sure to overlap generously (50%) to ensure that the bandage stays in place. Pull tight across the front, be firm around the back. Make sure your quilted wrap and outer standing wraps are smooth and unwrinkled. When the horse's leg is wrapped, do as professionals do and put a loop of wrap tape around the top to keep the bandage secure.